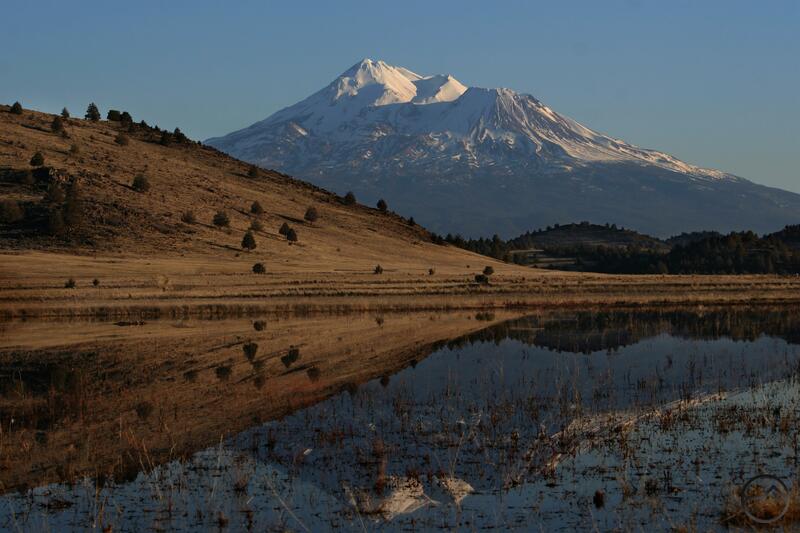 Mount Shasta towers above the Shasta Valley Wildlife Refuge. The Shasta Valley to the north of Mount Shasta is a starkly beautiful high desert region. Falling in Mount Shasta’s rainshadow, the valley’s dry environment is remarkably different from cool forests that surround the other sides of the massive volcano. It also differs from the higher, wooded areas in terms of public access. 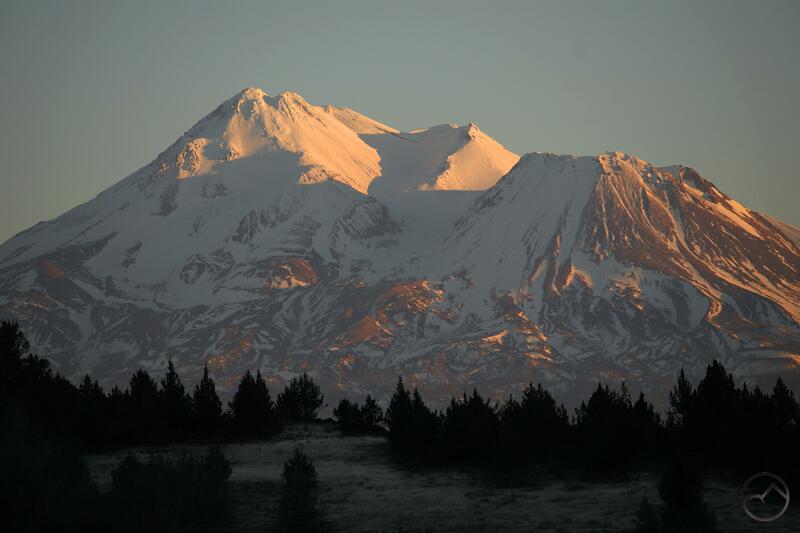 Where Mount Shasta and the surrounding mountains are all on public land and are open for recreation, only small pieces along the Shasta Valley’s southeastern fringe are open to the public. Consequently, most of the valley is off limits to hikers, which is particularly unfortunate in the winter and spring when the high desert environment means the potential for excellent, snow-free off season hiking. Fortunately, there is a single, lone exception to this situation. The Shasta Valley Wildlife Refuge, hidden in the northern end of the Shasta Valley, is a large 4,657 park administered by the California Department of Fish and Wildlife. Originally a ranch, the land has now been converted into a park that provides refuge to deer, coyotes, mountain lions and countless smaller mammals and birds. It is also a refuge for hikers eager to enjoy incredible views and warmer, drier lands during the colder parts of the year. The Goosenest and the Little Shasta River. If the wildlife refuge has one drawback with regards to hiking, it is the distinct lack of hiking trails. Officially, none exist within the park. Most infrastructure that currently exists is a remnant of the land’s other iteration as a ranch. There are gravel roads coursing through the park as well as older roads that resemble parallel single track trails. These older roads, when they are found, make great hiking paths. Irrigation channels, pumps and levees are still prevalent in the park as well. Some recreational amenities have been established, most notably the series of parking areas throughout the park. These implicitly encourage hikers to park and explore the refuge on foot. Unfortunately, a large part of the refuge, an area with some of the park’s most interesting terrain, is off limits to hikers in order to preserve the area specifically for wildlife. Despite this there are ample places to explore and incredible views to be in the rest of the refuge. Amazing view of Mount Shasta and Trout Lake. The most notable hike in the Shasta Valley Wildlife Refuge, and the one most resembling a traditional trail, is the Trout Lake Trail. This path follows first a series of levees, then a single track trail and finally a very old road that resembles a foot path far more than it does road. This hike hugs the west shore of surprisingly large Trout Lake, one of the refuge’s trio of small reservoirs known for their exceptional fishing. Trout Lake is also the most scenic of the three lakes. Mount Shasta towers majestically over the lake and is visible from most of the trail. In particular, the vista from the top of the west shore hill is one of the finest views of the mountain to be found anywhere. 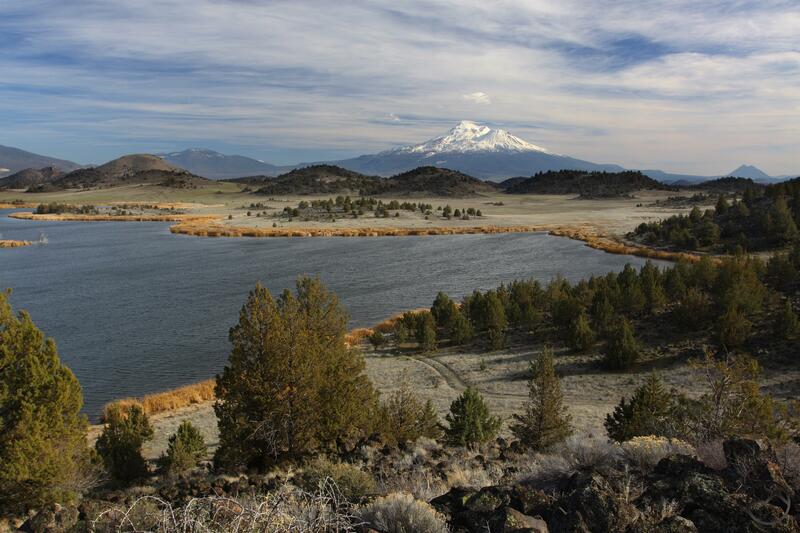 The contrast of the cool waters of Trout Lake contrasted by the arid high desert terrain and crowned by the glacier-clad volcano is tremendous. Steamboat Mountain from a refuge road. Though the Trout Lake Trail is the best hike in the refuge, it is by no means the only good option. If hikers are willing to hike the park’s roads there are several other interesting options for hiking. Most of the interesting sights are focused on three areas. The first is the Little Shasta River. This small river begins in the Little Shasta Meadow high in the Cascade Crest, on the slopes of Willow Creek Mountain. It flows west through an impressive canyon and eventually joins the Shasta River. The section of the Little Shasta River that passes through the wildlife refuge is the only section of the river that is publically accessible. While its waters are not swift moving as it flows through the park, it is still a refreshing sight to see the water making its way through the high desert. 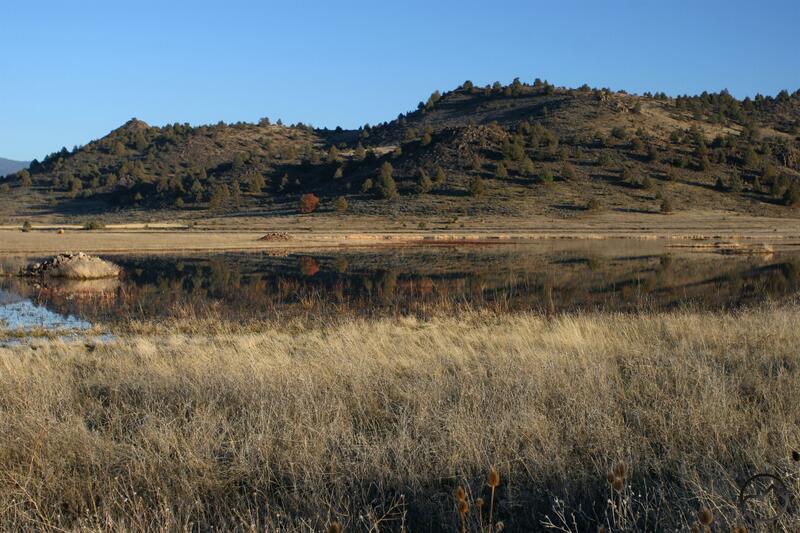 The second part of the refuge that will attract hikers is the Bass Lake area. It is possible to hike the lake’s entire shoreline. There is also a network of old, seldom used roads that connect Bass Lake to Trout Lake. These roads pass small volcanic hillocks, meadows and small ponds. The last part of the refuge to explore is the Steamboat Mountain area. Though the mountain itself is within the closed area, roads encircle the mountain and make for a great hiking loop. The views of the Cascade crest, including the Goosenest and Willow Creek Mountain are great on the north side of Steamboat Mountain. The road along the southern side of the mountain is tucked between Steamboat Mountain and Steamboat Lake, the park’s third reservoir. This part of the refuge in particular gets little use. While not focused on a single specific point, one other potentially good hiking opportunity would be to explore some of the many volcanic domes and hills that dot the refuge. A few of these have rugged, rocky jumbles of rocks on the top, giving them a turret-like appearance. A refuge sunset on Mount Shasta. Whichever area hikers decide to explore, they are in for a treat. The incredible spectacle of Mount Shasta looming above the arid land is fantastic and makes for awesome hiking. Even though the refuge lacks traditional hiking trails it is still a great destination for getting outside and enjoying nature even when the mountain trails are covered in snow or muddy. 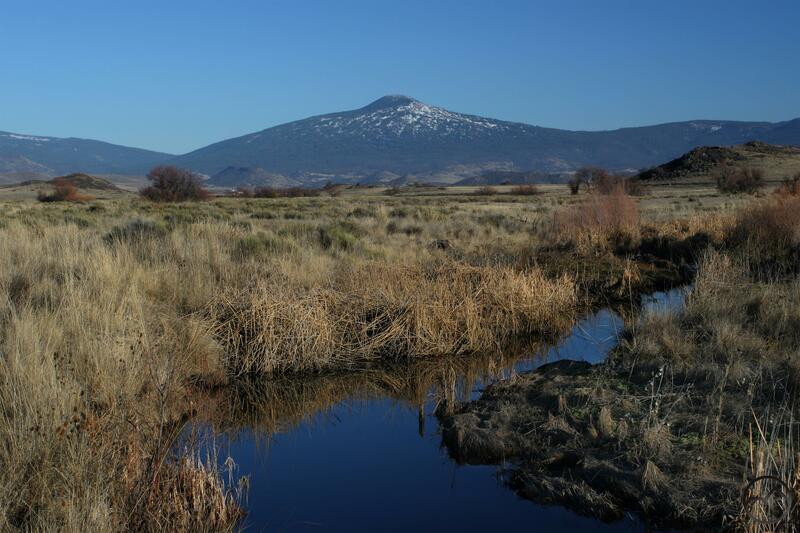 Even if visitors are not set on spending the day on foot, there are still many opportunities for nature lovers to enjoy themselves in the Shasta Valley Wildlife Refuge. Bird watchers will find much to appreciate and fishermen will appreciate the excellent fishing in the park’s lakes. Best of all, those blessed to enjoy a sunset at Trout Lake will experience one of the finest sunset views of Mount Shasta, complete with a reflection in the lake’s waters if the wind is not blowing. Considering how magnificent the view is and striking its landscape, it is crazy that the refuge remains fairly anonymous. Mount Shasta reflects in a pool by Steamboat Mountain. Your photos are truly stunning on this one. Wow. The first is the best, with the reflection. What’s better than Shasta? Two Shastas! I want to climb Mt. Shasta on May, can you help me find a guide?